Our ladies and guys stainless steel 6oz hip flasks are designed, printed and hand applied in South Carolina. Flasks are wrapped in high quality long, lasting vinyl and guaranteed to please this holiday season. Perfect for stocking stuffers! Giant kraken flask features a vintage etching of the great squid attacking the ship. If yes, please type your request with font and placement of your name, initials or short phrase in the 'add your personalization' box. We can place writing most anywhere on the design EXCEPT the backside center. If a font and position for the personalization are not specified by the buyer we will choose the placement for you. Provide current email in case we need to email you a mockup or have questions.. 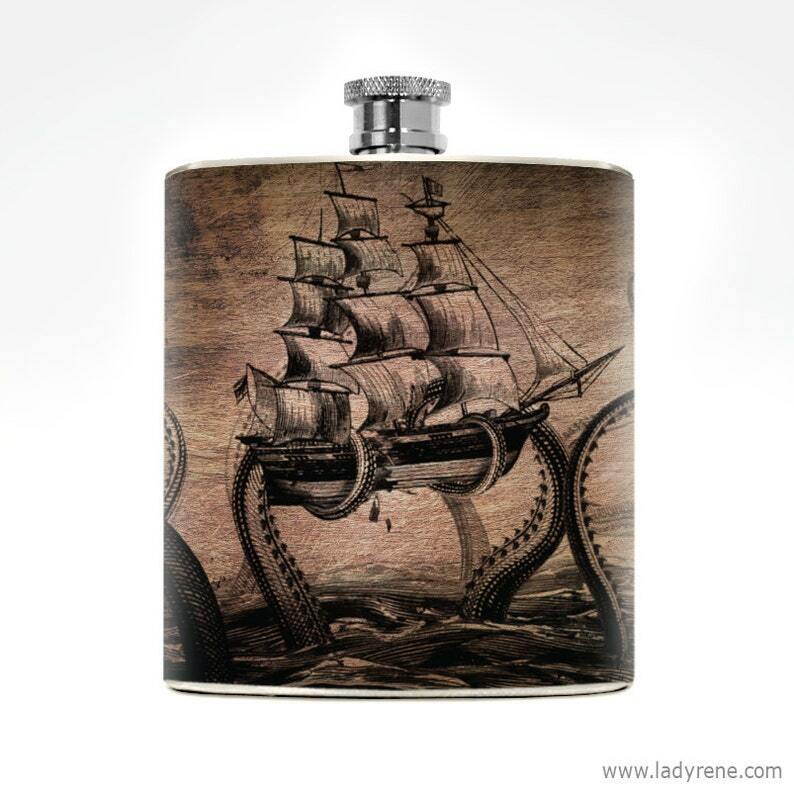 I got my husband this flask for his birthday and he loved it. I would definitely recommend it. I bought this for my boyfriends 21st birthday with the funnel. It’s super cute and I think he’ll love it because he’s in the Navy and it’s a ship theme! The only negative I have about it is that the cap isn’t attached to the flask so it may be easy to lose the cap depending on how clumsy you are (me).